NOTE: You only need to perform a system software update if your RetroN 5 unit is running old system software that does not meet the requirements of the application update you wish to install (the required system software version is specified along with each application update). Updates to the system software will be released infrequently, in contrast to the application software which will be updated every time new features are added, problems are resolved, etc. 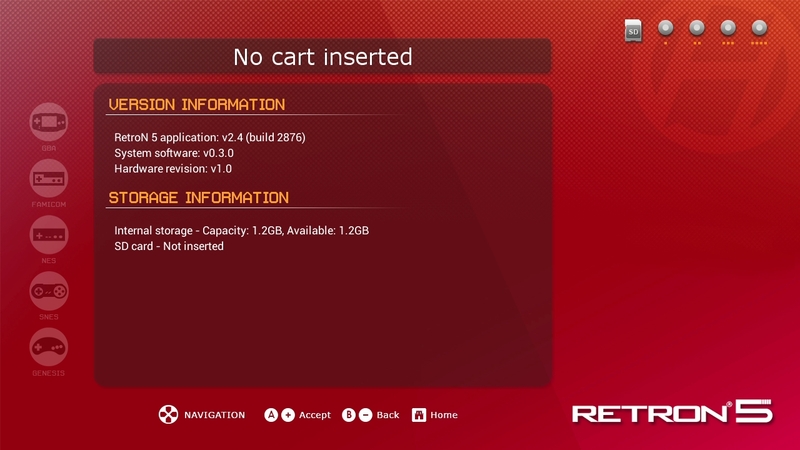 Once the update request has been generated, you may remove the SD card from RetroN 5 and connect it to a PC, you will of course need an appropriate SD card reader. Click the submit button. At this point your browser will initiate a download of a file labelled retron-update.bin - save or copy this file directly to your SD card. IMPORTANT: The file that you save to your SD card MUST be labelled retron-update.bin however some people's web browsers erroneously rename this to something such as retron-update-2.bin or similar. If this happens, please rename the file on your SD card to retron-update.bin (without any numbers) before proceeding. NOTE: this file is locked to your own Retron 5, so cannot be used by other Retron 5 owners. They will need to submit their own upgrade request. Safely remove the SD from your PC, then re-insert into your RetroN 5 unit. Follow the on-screen instructions to install the update. After the installation has completed, the system will restart and you will be running the latest version of Retron 5 - congratulations!